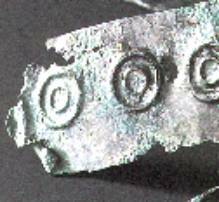 Corrosion is one of the greatest enemies of archaeological finds and findings. All kinds of materials are its victims: metals, glass, ceramics, mortars, stuccos, paper, leather, textiles, pigments, dyes etc. The kinds of reactions causing corrosion are as numerous as the kinds of materials. Water, liquid or vaporous, is the mother of the overwhelming majority of corrosion processes, supported by oxygen, carbon dioxide and other atmosperiles. Corrosion by radiation (electromagnetic or particles) can work without water, but humidity intensifies the attack. Carbonizing is the process of dehydration (withdrawal of water) of cellulose. Two special cases of corrosion will be treated here, the electrochemical corrosion of metals and the chemical corrosion of glass. The electrochemical corrosion of metals is due to the formation of local galvanic cells. The resulting electric current leads to the dissolution of the anode and the deposition of ions on the cathode. Such galvanic cells can be formed by one piece of metal which has two zones of different metal concentrations, surrounded by an electrolyte, an aqueous solution. This sounds to be strange, but the concentration of metal atoms in a piece of metal can be changed locally by extreme pressure, as e. g. caused by hammering. Since hammering is a frequent way of forming metal objects, this kind of corrosion happens often to metallic archaeological finds, not only of iron, but also of bronze and other metals. This effect makes metal plates look irregularly penetrated and if it were eaten away. P. C. Bol mentions briefly this phenomenon in his book Antike Bronzetechnik – Kunst und Handwerk antiker Erzbildner, Verlag Beck Muenchen (1985) pp. 18; 82. The photo shows a beaten bronze ornamental mounting of a celtic wooden box. The typical corrosion character can be seen. An instructive experiment is outlined here which can illustrate this effect. An iron nail is produced by cutting off a piece of wire and forming the head and the point by compressing and sharpening its ends, respectively, at room temperature. Due to the extreme mechanical stress in cold condition the crystal lattice in these zones is condensed, the concentration of iron atoms locally increased. This leads – together with a certain roughening of the surface - to a higher tendency to dissolve here than in zones which have not been deformed. When immersed in an electrolyte, head and point of the nail are the anodes, the shank is the cathode of the galvanic concentration cell formed. The dissolved iron, present as iron ions, can be detected by a suitable reagent. In this case potassium hexacyanoferrate(II) has been chosen, which reacts with iron ions to a blue compound, called Berlin Blue. Length of nail 80 mm. 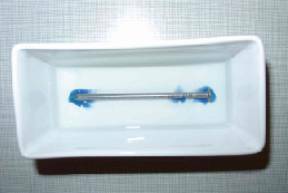 The picture given here shows a nail embedded in a gelatine gel containing a low concentration of the reagent. You see the blue spots around head and point, indicating that the nail starts here to dissolve. The third blue zone developed at a little damage of the shank which caused a compression and/or damage of the crystal lattice also here. This picture illustrates that compressed zones, e. g. caused by beating or hammering, corrode easier than not compressed zones. Generally, beaten objects corrode easier than cast objects. But be carefull: The type of alloy, the wall thickness and the roughness of the object also play a role. Their influence will add to the electrochemical effect. Glass is not as resistant against attacks of corrosive media as one may think. Even water leads to corrosion by dissolving the alkalimetal ions, preferred potassium. Acid and alkaline substances intensify corrosion. Antique or medieval glass is not a homogenious material but consists of two or more different phases (kinds of glass), which are more or less soluble in one another. They exist side by side, mostly in form of bubbles of one phase in a surrounding matrix of the other phase. These different kinds of glass have different corrosion properties, one corrodes more easily than another one. 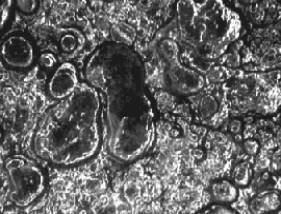 This leads to a characteristic corrosion phenomenon which is shown in the following picture. Corroded surface of a medieval potassium glass fragment. 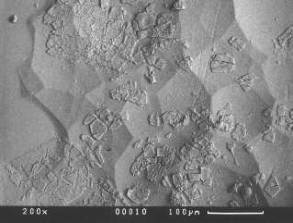 The photo shows deepenings formed by complete dissolution of the more soluble potassium glass phase in the more resistant matrix. The structures are flattened by the blowing process. (Surface microscope, magnified 15 times. The deepenings can be seen with the naked eye). The next photo shows the ongoing corrosion process by formation of little tiles. In a more developed condition these tiles can be seen with the naked eye as little silvery plates, looking like mica. Corrosion process in progress by formation of little tiles flaking off. (Scanning electron microscope, magnified 200 times). The relatively low corrosion resistance of potassium glass (wood-ashes glass) is responsible for the bad condition of many medieval coloured church windows. By the way: also the corrosion of ceramics starts with the dissolution of potassium ions. Literature: P. Kurzmann, Mittelalterliche Glastechnologie (2004).